Elder SUP to Elder Sail? Sailing has been a big part of my life since the late 1960’s when my (then high school sweetie) Ed taught me how. We sailed all over the Atlantic off Hollywood Beach, FL until our honeymoon in 1970. Then we chartered a sweet sloop and explored the Abaco, Bahamas out islands. Over the years we were crew or captain on many ocean races and sailed our Hobie Cat and our Cal 25 for fun and adventures. In the early 1980’s I wrote a weight training/endurance article for WindRider magazine in trade for a sailboard. Surfing and sailing – what a combo. I did not love it at first try – but after about 6 different sessions over many days I remember clearly that “aha” moment when things clicked. I was hooked. What an amazing way to “surf” when there were little waves. In S. Florida there always seems to be a steady breeze. I would drag my little kids along (literally) – these days there is no way I’d do that without flotation devices – ahh, the 80’s were another era altogether. Finally, after almost 40 years I am the proud owner of a Starboard Windsurfer. It is inflatable and easy to travel with. Where do I plan to take it for my first warm water adventure? Back to the Abaco, Bahamas out-islands, of course. A great feature of the 12′ 6″ Touring board with Zen technology is that it can easily be paddled so that SUP fun can partner with windsurfing fun. Once I am back from the Bahamas and home in Ben, I know I will have plenty of days spent up at Elk Lake. Before Hood River and the Columbia Gorge brought sailboarding to new levels of speed, planing and and now – foiling, Elk Lake was the scene of its share of riding the wind. I am hoping to inspire more people to join me this summer! 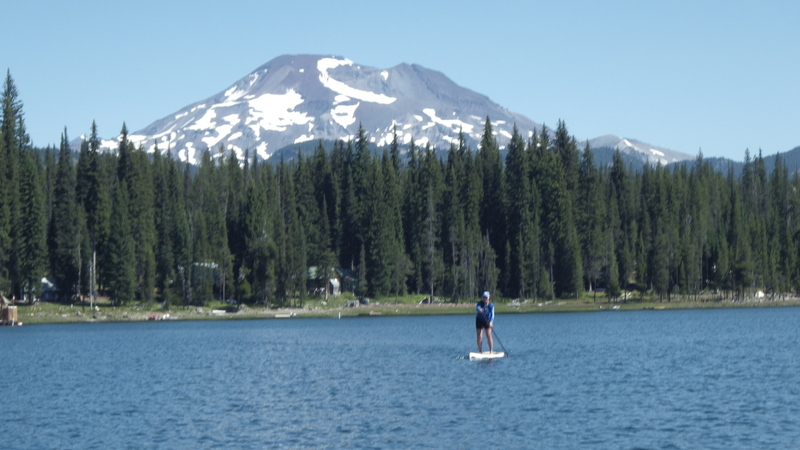 Elk Lake, is about a 35-40 minute drive from Bend, Oregon and though the Elk Lake Lodge is open year round, the lake and road are usually open from Memorial Day weekend til the first snows in the Fall. Typically the lake is flat in the morning and the winds kick in during the middle of the afternoon. Most windsurfing happens after 1 p.m. If you paddle and/or windsurf this lake, be sure to tuck some ice cream money in your board shorts and stop by the Elk Lake Lodge on the West side of the Lake (opposite Sunset Beach). 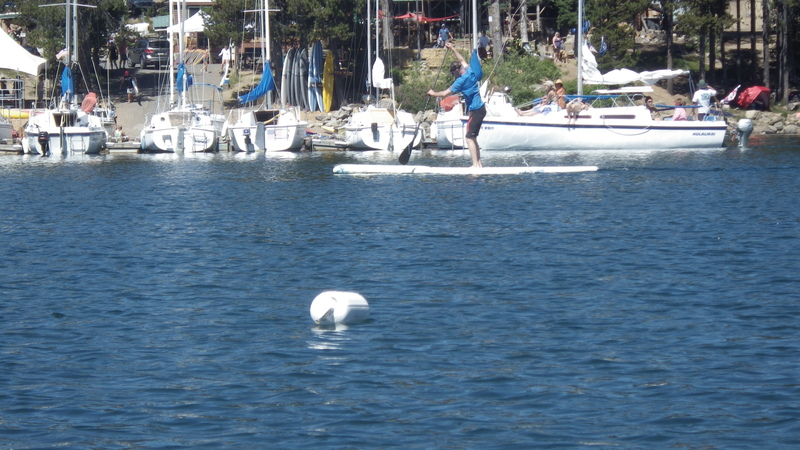 The buoys are set up as a race course for standup paddling right now. It’s gonna be fun to windsurf big boards or paddle. I celebrated my 69th birthday with a day of training, contemplation, gratitude and so much beauty. The training was unusual, in a way, but some of the most valuable I have had for down wind conditions that could get gnarly. In August my Starboard Freeride 12’2″ X 30 and my KIALOA paddle will carry me the classic run from Viento to Hood River and I hope the wind is strong and the day is sunny! My first adventure in the Columbia Gorge Paddle Challenge was in 2013 and I was hooked. (story here) I want to be ready to enjoy every moment of the experience when I am back on the mighty Columbia. What follows in this article is an odd set of insights and lessons I gained from paddling 4 uniquely different Oregon alpine lakes in one day. It started out at 8 am at Elk Lake. By 10 am the wind cranks up in this volcano rimmed jewel, but it was mirror calm when I headed out to circumnavigate its 4 miles including every little bay, nook and cranny at 8 am. In this flatwater goodness I observed two things that can improve my skills for down wind action. Eyes closed – All alone on this huge body of water I was brave enough to try 6 paddle strokes per side for 3 sets repeated dozens of times. Wow! Balance and feel for how I was moving over the water was an eye-opener (LOL, eyes were shut!) Charging down wind in wind and waves requires solid balance and feel for how the board and water interact. This was so much fun. I grabbed a breakfast burrito then headed over to nearby Hosmer Lake for a sweet three mile exploration to gurgling waterfalls and crystal clear water. The wind had picked up some by the time I got there. On this, just the second time unloading my board from the car I did make a mental note to really use my body correctly in the awkward motion of high reach, lift and lower. After all, a 69 year old body does not respond well to injury from lifting. The wind was hard in my face leaving the boat launch area but reading the water I saw the far shoreline was protected and calm. In my journey to get to the calm I learned something else, sound can really impact my cadence and speed. Even though the wind was in my face, my distance tracker app told me later that I hit 6 mph while the effort was perceived as simply fun. The tick-tick-tick of choppy wind waves hitting my bow and tapping along under my board gave me energy. I paddled the 3/4 mile to the calm in what would have been a speed interval, if I had thought of it like that. Instead the sound of the water made the experience pure fun. I meandered off to the right hand fork of Hosmer, climbed a volcanic rocky area to gaze on gurgling lava tubes feeding a flower-filled grotto. Heading back to the boat ramp the water grasses and lilies caught my attention, fish darting and beauty everywhere. Insight – I am blissful on the water – how about you! Ocean girl at heart, all water has its compelling call. Loading up my board again I was off the 30 acre Devil’s Lake. I almost skipped it. There were 30 cars at the easiest launch area so I had to park where a steep bank tested my strength and balance carrying a 12’2″ board through the trees and scree. Once in the lake my feet nearly froze off from the snow-melt water. The lake is so shallow that I had to walk about 100 yards to depth enough to paddle. Know you water and wear appropriate gear. My frozen feet situation was mild and quickly over, but it made me think about knowing local conditions. I had forgotten that Elk Lake was practically swim-able whereas small Devil’s Lake was icy. The day was sunny – but water has its own characteristics. Getting out of Devil’s Lake, carrying the board about 1/4 mile to my car and loading it up again reminded me to protect back and shoulders, use legs to lift – and yes – do some weight training. Next stop was Sparks Lake. It is about a 1 mile drive in to the launch area, on a rutted, deep holes, washboard, dusty, rocky road. Once there I saw it was packed in both the launch and the parking area. The only spot I could put my car was easily 1/2 mile away. I left my precious board alone among some trees by the launch and went to park the car and walk back. Would my board be there when I got back (yes). I love this lake and never tire of winding around the rocks, the deeps, the shallows and taking the same photo every time I go. Peeking through rough-carved lava and spotting South Sister and Mt Bachelor never gets old. By this time with all the loading and unloading, more walking than I had planned on and 9 miles of paddling completed in 3 lakes in about 3 hours, I needed a strategy to make this last adventure fun. My lower back was a little tweaky and my lats had had a good workout. It was time to focus on engaging a body rotation and abs engagement during the paddling. Paying attention to keeping my shoulder relaxed- not hunched up toward my ears- and shoulder blades “down on my back” Helped with getting a clean catch. Rotating with awareness and taking the blade out of the water soon enough took my attention away from fatigue. Insight: When fatigue starts to set in we can focus on what part of our body is most tired and engage in a different way. Something as simple as enjoying the feel of water lapping on bare toes can power us through a choppy, windy area. Happy birthday to me! It is overwhelming to imagine that this time next year I will be 70. A new decade, and not getting any younger ever again. Except in my mind. Playful, youthful water fun is available. I commit to playing attention – and training as smart as possible. If you have any suggestions – send them my way. SUP Race: What’s a Win? 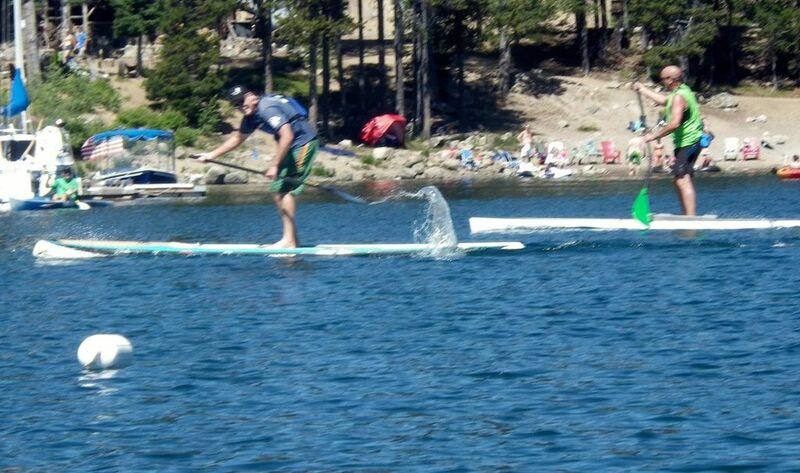 Last week I came in dead last in a local standup paddle race – and I won. I won two ways. The first was not so cool – In the 50+ age group (for this 64 year-old) I was the only entrant so I won. The other way I won was by having an awesome summer day at the lake, meeting new friends and learning lots of new skills. I often ponder the dynamic between a vibrant SUP paddling community and the SUP racing scene. On the one hand, everyone from a newbie paddler, to families, to elite racers has a better time on the water with friends. On the other, racing – competition – can be intimidating. In paddling, like sailing, tennis, cycling and running, committing to a race event can be the best route to meeting more friends at your level while honing your skills to the next level. Winning – or losing – can easily become a less important side note. 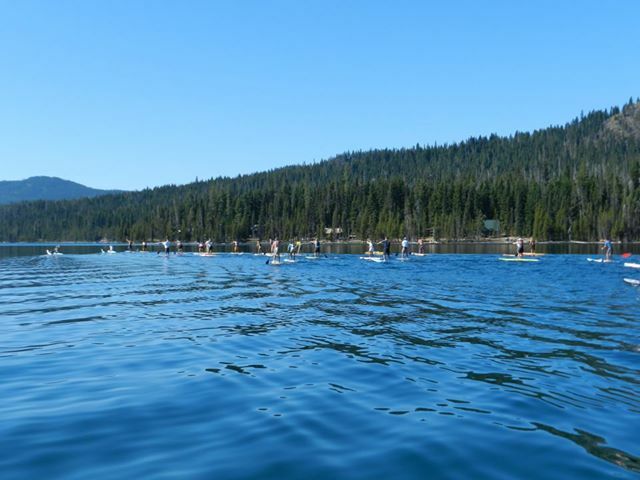 In town (Bend, OR) with 50 or more paddleboards negotiating stretches of our Deschutes River almost any time all summer long, there were just 18 participants in one of the best long course, WPA sanctioned races you’ll find on a fun-family lake. 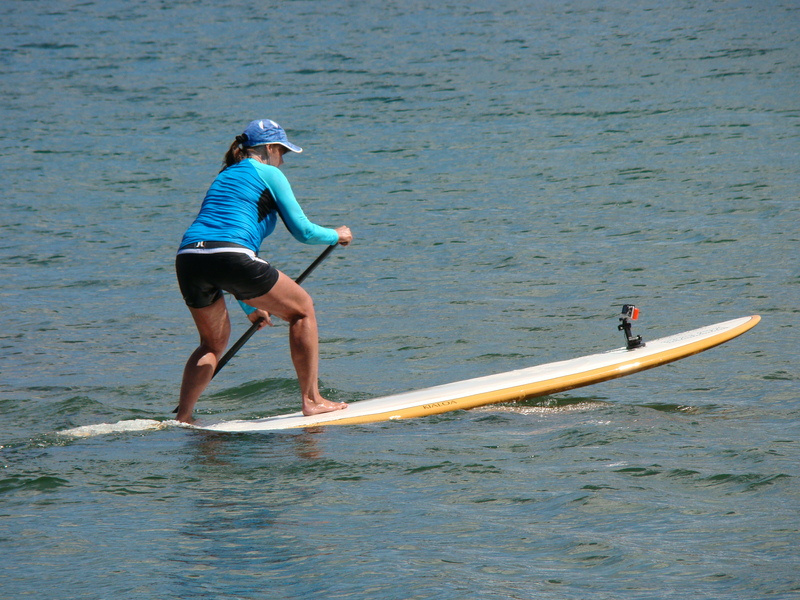 Elk Lake Resort, along with KIALOA Paddles, Standup Paddle Bend sponsored the event followed by a barbecue, included in the race fee. Donations went to the Deschutes Paddle Alliance. Aside from enjoying some of the finest hamburgers, local beer and all the fixings, we had the chance to hang out at the lake all day long. BY 5 PM the Pitchtones were on the point playing for us all as the sun went down and the moon came up. Having fun honing great technique and celebrating a lot of endurance work – go Tom! Casually, the day turned into endless impromptu technical “clinics” as various participants shared expertise with us all we all learned something new about paddle technique, board attributes, cross-training, the wind and more. This “free clinic” format mirrored a similar community-building event hosted by KIALOA Paddles at the Bend Paddle Challenge just a month ago. The roaring success seemed to have inspired us all. The only negative to the entire day was that 25-30 new paddlers, kids and parents were not enjoying the 2.5-mile short course. Instead there were just 3 entrants. How cool if new paddlers and kids took the chance and got in the short course event. They would paddle hard and come in somewhere. I sewed up “caboose” in the long course, who would have been my short course twin? After fun and new friends at the BBQ we could all take a tour of the bay, check out the pirate ship, swim in the lee side calms and share paddling tips. The excellent fun of the first of the Elk Lake series will be repeated on August 24th and September 14 (followed by a luau and music by Bill Keale. You know it – no matter what place you come in you are going to score a WIN if you simply show up – board ready and paddle in hand. The informal “free” clinic fun of everyone sharing what they know will be icing on the cake. Please contact me if you have questions, comments or pictures to share. Some more photos of beautiful Elk Lake (click on the thumbnail for larger image) See YOU August 24th. We often point to competition as a tool to bring out the best in people. You will run faster or work harder or fight more ferociously if there’s someone breathing down your neck or a record to be broken. The problem with competition for a great percentage of most people “playing at a sport” is that it holds them back from leaping into the “game.” For many, competition takes away the plain old playful fun, the invitation to invent your own method, to find a new way. Competition is great for gathering energy, audience and refining our skills to new levels. But if a huge momentum of new participants in events is a goal, there might be a complementary opportunity for race directors and organizers. When you have competition, it’s the pack that decides what’s going to happen next, participants merely try to get (or stay) in front. Elder SUP will be designing a new addition to the standup race menu of choices. We will design 15-30 minute SUP-Ventures, game-like short quests on the land and water for all levels and abilities of standup paddlers. Generating lots more “race” and event participants, providing an entertaining extra show for spectators, involving more people while building a strong standup paddle community is our goal. We’d love to hear your ideas and comments on this topic. Meanwhile, as we design and plan new ways to flatwater SUP play, enjoy this smile-generating video – the joy of SUP play!